When I was deeply involved in Android: Netrunner, people had an occasionally silly manner of judging the cost of a card. They'd factor in everything, including the fact that you needed to spend an action to draw it and an action to play it. Depending on the day and my mood, it teetered on the fulcrum between logical and ridiculous. I think that it's a bit harder to quantify in this game because we can only calculate expected energy and average fielding costs. We don't know what we have to work with until we roll the dice, so hard numbers like in the Netrunner discussions are a bit more difficult to identify and work with. That said, I think that there are costs to examine here that go beyond the cost to buy the die and the cost to field - there are things that you're rolling that are not characters to buy or pay the fielding cost. There's an enormous time cost here as well, and that can determine the real value of a die. Finally, there's a cost just to purchasing more dice, because that means that there's more in your bag that isn't what you want. Let's dig in. What are you doing when you buy a character? You're spending the energy faces from a dice. That much is obvious. But have you rerolled that die to see if you can get something else? Should you? That is the asterisk on the purchase cost - buying this die means that you're not using the die that the energy came from for something else. What if that was a churn option, like a Beast? Just as important as what you elect to purchase is what you elect not to purchase. Sure you can afford that expensive character now, but what does it do for you to field it before you have anything set up to support it? Some can work on their own, but most can't. Further, consider how many dice you've just placed in the used pile to purchase - all of these (and more) dice could potentially be drawn from the bag before you ever get to your big purchase. This is pretty obvious on its own, not to mention from the discussions of churn that we've had. The more dice in your bag, the harder it's going to be to draw what you need - and potentially the longer it will take to draw a desired die. This is why after a point you need to get things in the field so that they're not cluttering your bag. This is the deck building within the deck building - you know who your team is that you've brought to the table, but who will you use? How many dice purchased on a given character is enough? You need to be a good judge of this to play effectively. Otherwise, it could take many, many turns to get an expensive Hulk or Cyclops into your hand to roll. Time spent on that for you is time gained for your opponent. Time for them to make a key purchase, field a key character, time for them to win before you could mobilize your win condition. Of course, the inverse is also true, and we've discussed that in dealing with the shortcomings of Gobby. Since Gobby encourages the fielding of sidekick dice rather than using them for energy, he is essentially anti-churn. He creates a situation where four sidekicks that roll out MASK - MASK - SIDEKICK - SIDEKICK, the preferable move is to buy, say, one Beast and field two instead of buying two Beasts. With skill and the right rolls, he can mitigate this by being fast. But apart from the ideal, it means that down the road, that's one less die helping pull more dice out of your bag. It's true that the Sidekicks prevent dilution, but that's now energy lost - unless you use the energy faces on Gobby or Beast, in which case why did you buy them anyway? The question that needs to be asked is this, especially when going for a high-cost die (of which you are likely only going to purchase one): If it takes the longest possible time to move from used to the bag, and from the bag to drawing for a roll, is what the die offers still worthwhile? If the answer is yes, then this is a justifiable purchase. If the answer is "no," it's either ineffective or a "win-more" card in your situation at that point in time. This is also why the seven cost cards that are worth purchasing are the ones that have "...and then I win" implied in the text. If they're not a game-clinching card, what value does it really have? Very nice article. Covers a lot of what I have been thinking on recently with purchases in a much more succinct and focused way. Seems that the best time to buy a new die with energy is right before you will refill your bag. 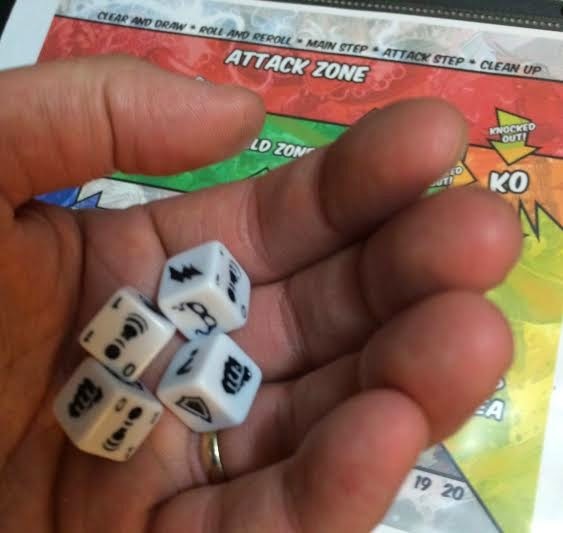 The ideal would be to field a sidekick, buy a new die with double energy from character dice, then have the opportunity to draw it next turn. Culling SKs and expanding options all at once.